This summer at Fuzzy Math, we are exploring the impact and interactions of wearable technology as each member of our team participates in a three-month-long project to explore the ins and outs of these devices. This endeavor will be broken down into three phases: 1) first impressions and getting to know one’s wearable device, 2) empirical evidence and applications for it, and 3) heuristics for each category of devices. This summer-long study is comprised of three separate category groups for the sake of tracking and analyzing data and findings. These groups are activity, awareness, and sleep. For more information, read our introductory post on this project and follow @fuzzymath on twitter, hashtag: #fmwearables. 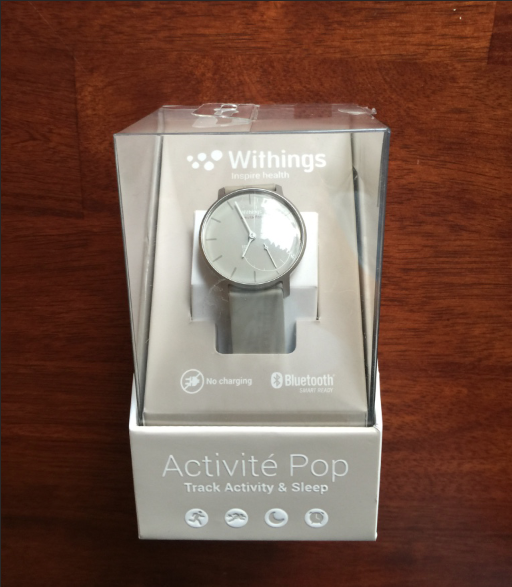 I’m here to introduce to you the Withings Activité Pop. Yes that’s Activé with an é. 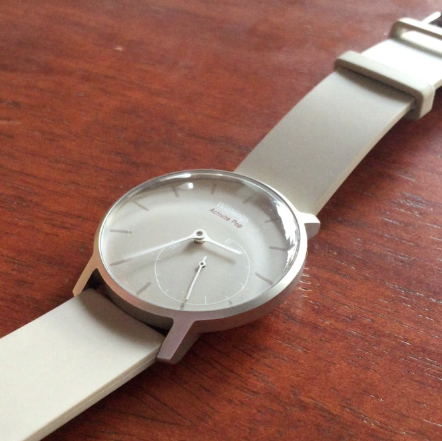 This wearable attributes its design to Paris, but is manufactured in China. A stark contrast from it’s older sibling who is proudly Swiss-made, and accordingly priced. That being said, the Activité Pop is no slouch when it comes to design. When I recieved the box, the Activité Pop sat there welcomingly displayed in its plastic window. It most definitely looked like a watch. Outfitted with a watch battery and an analogue face that laughs at my millennial inability to tell time. 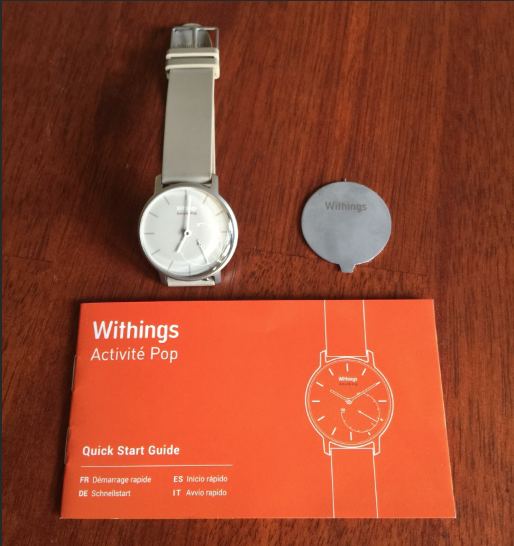 After carefully taking it apart, I was left with an Activité Pop watch, a restart/battery replacement helper tool, and an instructional booklet. 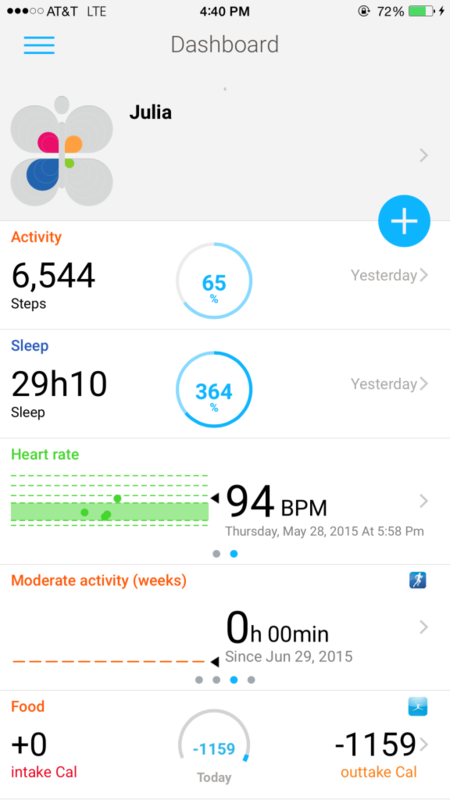 I followed the directions on my Withings HealthMate app until the watch buzzed to life. The Activité Pop’s practicality and invisibility as a wearable device appealed to me. Full disclosure: I am not a huge fan of current wearables aesthetics. Do they belong in a gym? Sure, they look great there. Do they belong on my wrist while I wear different outfits? Not so much. This is all, however, a huge matter of personal taste. But I’d prefer to keep my fitness tracking on the down-low. The category that I chose was Activity. I realized that I could use a little more daily activity than just letting my brain wander. Desk jobs don’t exactly facilitate an active lifestyle, so I thought my Activité Pop would become my motivation. The Activité Pop seemed like a great choice. 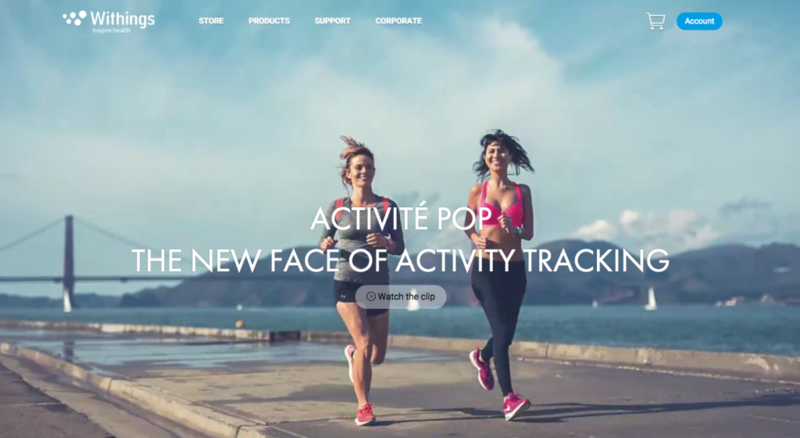 Withings’ website looped videos of cool looking sporty youths being active and looking stylish. It was the only wearable I found that didn’t look like it was created for the specific purpose of being noticed as a wearable device. In the beginning, the watch made me very aware of my level of activity. However as soon as I saw that the data collected was not necessarily accurate, the credibility (and my motivation) kind of took a nose dive. It might be too soon to say. You’ll have to stick around to find out what happens next! 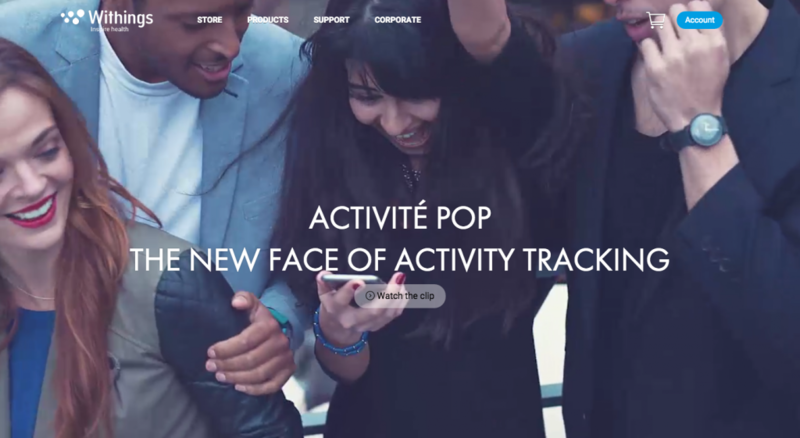 My Activité Pop was presented to look sporty-fancy. It’s clearly for laid back urban people who need to get their workout in without sacrificing style. The measurement from zero to 100 lets you know how close you are, percentage-wise, to reaching your daily step goal. You have the choice to set how many steps you’d like accomplish per day. 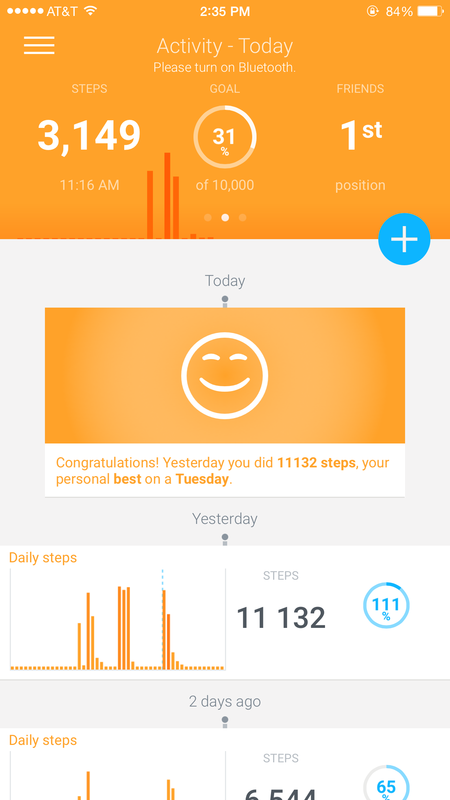 As you go through your day and your steps increase (or in my case, stay about the same between the hours of 9:00 am and 5:00 pm) the little arrow moves from zero to 100 (to show the percentage of your step goal you’ve met). Just don’t you dare tear your eyes away if you want to celebrate the sweet moment of reaching 100. Blink and your watch will be back to zero. It resets every time the ticker reaches 100. Not very motivational. 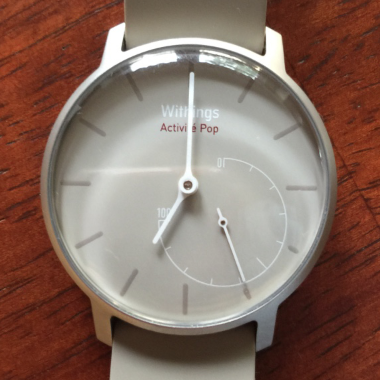 The Activité Pop is nothing but a glorified old-school watch without its app. The relatively easy to find HealthMate App takes you through a simple setup process to get your watch paired. 1. Turn on your bluetooth. 2. Take the little circular tool and push the reset button. 3. When you let go it vibrates. 4. Go to the next page. 3. Go to the next page. 4. Let go of Reset button till it vibrates. …So maybe it was a bit frustrating, but all in all, not that difficult. The App has butterfly shaped subdivisions that the user is supposed to “fill” over time. The categories are: weight, activity, sleep, and heart. In each of these subdivisions you can select third party apps on your own to help you keep track. Overall, the app acts as a shell for other apps to fill in. The current apps available to float in are: Run Keeper, My Fitness Pal, Nike+, Nest, and BodyMedia. However, these apps cannot be accessed through the HealthMate app itself. One day I forgot to open Run Keeper to track a particularly grueling run. I must have had five apps open but forgot that one. The end result was that my Activité only counted some steps, so I didn’t experience the full functionality. As you scroll down your Dashboard, it shows you your recent activity, sleep, heart rate, and other information from integrated apps. 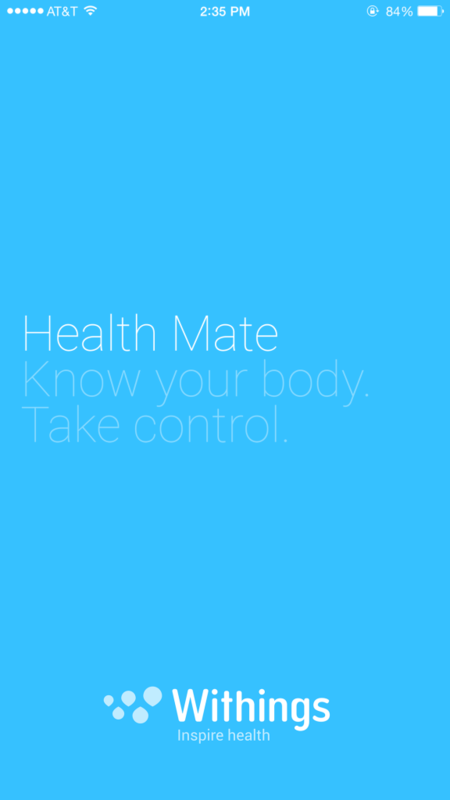 There is also a desktop version of the HealthMate App. That is essentially identical to the mobile app but gives you the capability to drill down further into your data. 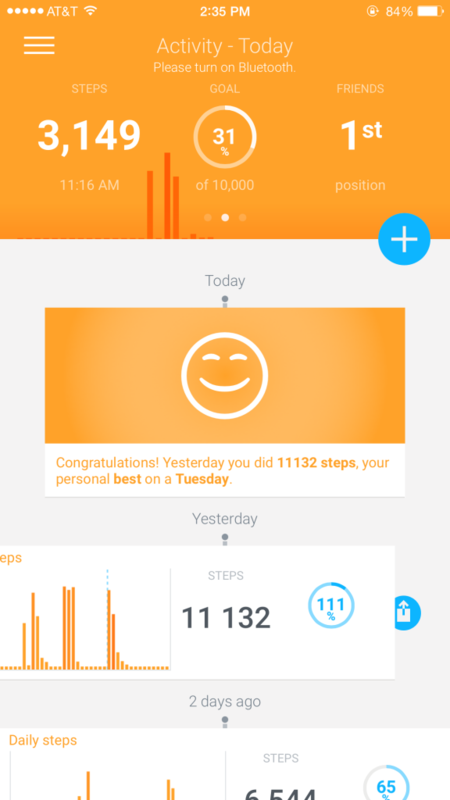 How do I see more about the daily steps? How do I get to my friends? It took me way longer to find than I’d like to admit. As someone who doesn’t generally wear anything on her wrists, the watch was hard to get accustomed to at first. Eventually, I became attached and my wrist felt empty after forgetting it at home one day. The strap is rubbery and doesn’t allow your wrist to breathe. This is fine for day to day wear, but during the night or after running (especially during the summer) sweat just pools underneath. Does that sound gross and uncomfortable to you? Well that’s because it is. Despite its sometimes sticky and uncomfortable feel, I have had multiple compliments on it from strangers and they seemed very confused when I explained that it was a wearable device. 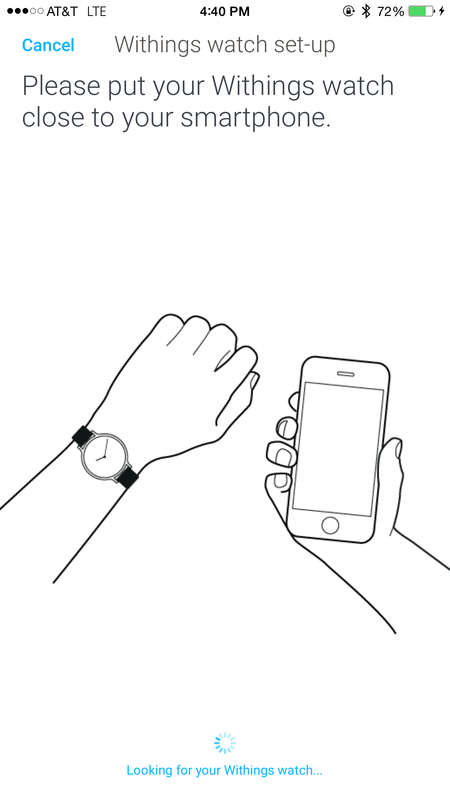 All in all, I did want my watch to seem “invisible” and stylish, and the Activité Pop delivers. For the most part, the watch is comfortable and aesthetically pleasing. However, the actual functionality of the watch leaves much to be desired. The Activité Pop feels very 1.0 in terms of accuracy and reliability. Many functions I assume will be improved with a software update. Any time I set my watch down or cease to move it for a few minutes, the watch “automagically” assumes that I am asleep. It makes it difficult to trust when I actually wear my watch to sleep. Does it truly know how long it takes me to fall asleep? Is the data accurate? Also, one time—first thing in the morning—I walked across my room and back. After expectantly looking at my watch, it said that I had not walked any steps. My point, losing trust in a wearable is a one-way ticket to being bored and abandoning it. The battery is promised to last for approximately eight months. It is very convenient not to have to think about charging it at all. I’ll keep you posted for the rest of the time. Is it matching my expectations? After reading glowing reviews of the Activité Pop, I might have gone into this with slightly raised expectations. Little things like not counting steps when I’m holding a bag, or being able to swing my arm a few times while playing guitar resulting in a high step count are frustrating. On the other hand, it’s great to see what the potential for wearables can be. One day we’ll look back and laugh at our so called “prototype” wearables. All things considered, the watch itself is aesthetically pleasing and doesn’t let the world know that I’m sporting a wearable. I’m optimistic to see how it will function with an update soon.